Warsaw lost its second game in as many nights Saturday at Huntington North. The Tigers trailed just 17-16 at halftime but a 14-5 third period made the difference. The Vikings converted 21 of 28 free throws at the game, including 15 of 18 in the second half. 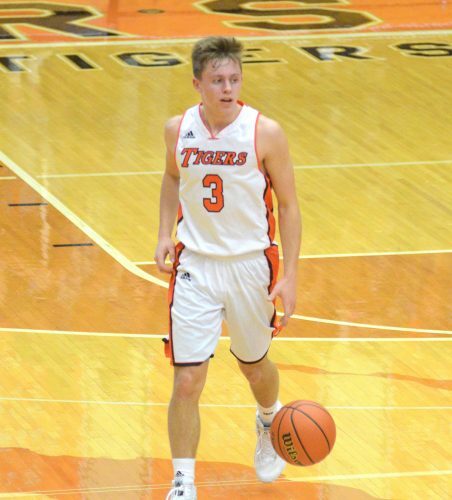 Nolan Groninger scored 12 points with four assists and two steals to lead the Tigers, while Brian Elliott and Wyatt Amiss each scored eight points in the loss. Hank Pulver put up a double-double with game-highs of 19 points and 11 rebounds for Huntington North in a performance that included 9-of-12 free throw shooting. Zach Daugherty scored 10 for the Vikings (3-1). Warsaw (2-2) will host Lake Central next Friday at 7:45 p.m. Meanwhile Saturday, Warsaw’s JV lost a narrow, 50-49 contest after a game that featured six lead changes and eight ties. Bishop Walters notched 15 points, and Jackson Dawson scored 11 for the JV Tigers. Sam Thompson put up 17 to lead Huntington North’s JV, followed by Aidan Hosler’s 13. Warsaw’s freshmen earned a 48-23 win over Huntington North Saturday. Judah Simfukwe and Hunter Rice both scored 11 to lead the frosh Tigers, while Kyle Dawson scored nine, Jeremy Ryman put up eight, and Seth Hildebrand finished with four. The Lakeland Junior High boys basketball team earned a win over Lakewood Park Saturday. Seth Martin made a pair of 3-pointers on his way to a team-high 19 points, while Jamie Wyatt finished with 10 points for Lakeland (2-0). Josiah Miller and Colin Ziebarth both scored five points, and Will Hotchkin and Ben Jackson each scored four. Valley’s eighth grade boys won two games to take the holiday tournament championship. Valley beat Wabash 47-35 and Crestview 36-25. Stats for the tournament were not provided. Valley couldn’t keep pace with the Apaches on Saturday. Wade Jones led Valley with seven points and Kyler Smith came in with six points.